We want to thank you for stopping by and hope you visit our DTs blogs and leave them some love! Don't forget, you have a chance at winning a gift certificate to the STORE by uploading your creations to our Customer Gallery! Have a great week and check back here on Friday for more inspiration from my amazing DT sisters! Well, after making a house type of project for Marci (see yesterday's post), I just had to make a little house for our Tuffy too!! I know Tuffy stamps are not yet as popular as our Marci and Luka, but he is WAY TOO CUTE to be forgotten! This dog stamp is one of four stamps in Tuffy Stamp Set, it also comes with five sentiments and three coordinating doggy stamps. You can buy this Stamp Set in our online store HERE. 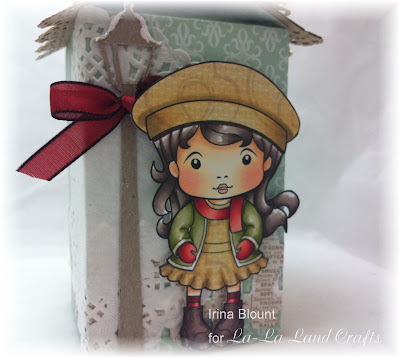 I added Santa Hat - this stamp is one of the stamps from some Stampin' Up set - sorry it was loose in my container and I do not recall what set it came from. This house shaped Treat Container was cut with my Silhouette Cameo. 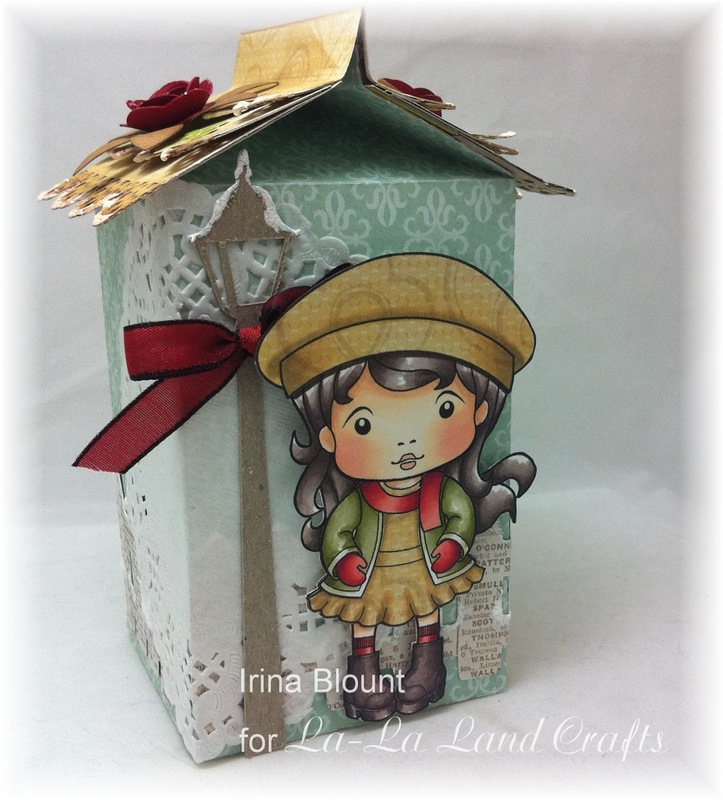 It measures approximately 3" x 4". 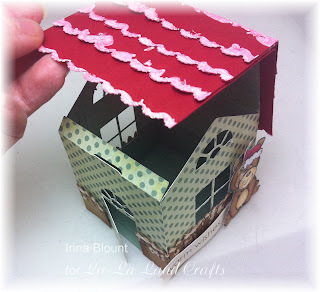 I admit, I LOVE project which have anything to do with Houses! 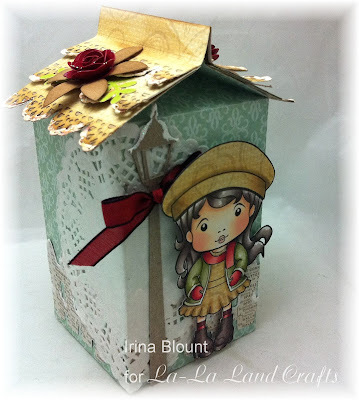 When I saw the most awesome tutorial on Whiff of Joy blog, I fell in LOVE with the project and the idea of making a milk carton to look like a house. 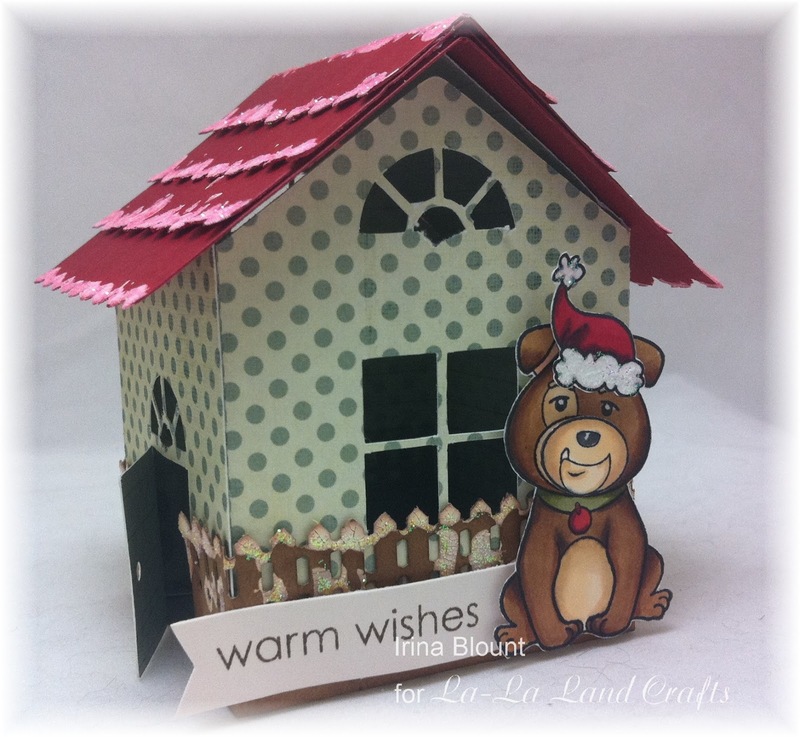 It is so perfect that I almost ordered both the die and the large die cutting machine just to make the project. Then I had one of those AHA!! moments ;-) WOOHOO!! 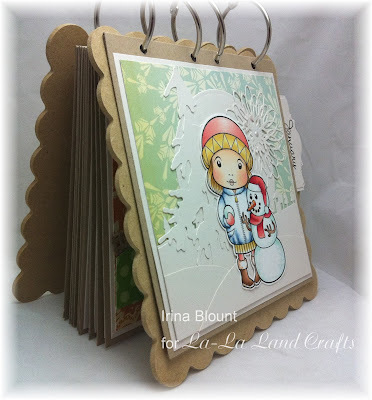 See, my new Silhouette Cameo cuts 12" x 12" paper and I can now make larger projects!! I even found a template for the milk carton and after about an hour playing with different sizes, here it is! TADA!! I closed the top of the container to create the roof, but you can still open it on the bottom. It is sooo cute!! Seriously!! An absolutely perfect container to use for the holiday gift giving. I am going to make a summery one later on too, really want to make one with our Marci with Flower. Thank you SO MUCH for the inspiration Angie! The Lamp Post was also cut out of chipboard with my Silhouette, yes - it now cuts thin chipboard too!! I thought that our Autumn Marci would fit this project the best. 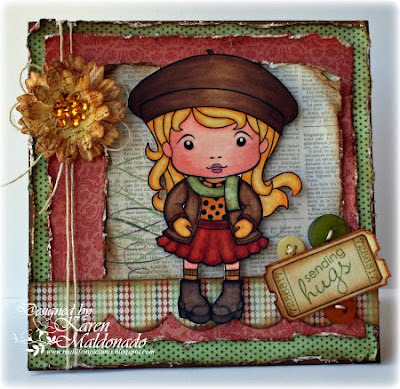 I paper pieced Marci's beret and dress. This is one of the projects for my October Workshop! To see other projects for this Workshop please click HERE. This Workshop is by invitation only. If you would like to attend but did not receive an Evite invitation from me, please email me at irina_ca@msn.com and I will add you to my email list. 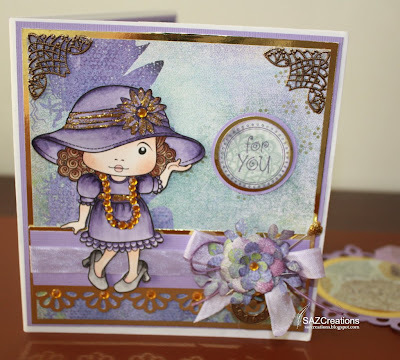 Cindy Haffner has used Angel Marci as well! 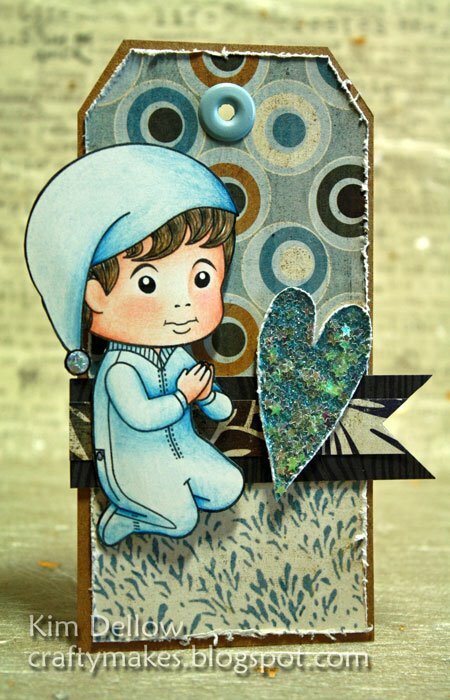 Sue has used Marci with Snowman too! 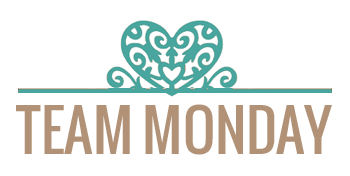 Every Monday and Friday our Design Team will bring you a new and inspirational theme.We hope our post today inspires you to be creative. Don't forget to link up in the Customer Gallery if you play along. You could be the lucky winner of our monthly prize. 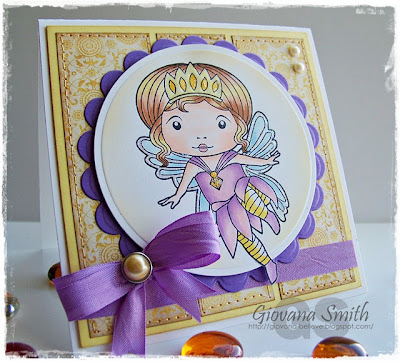 Next I would like to show you this pretty with Faerie Marci card by Giovanna. We just love the sweetness of it, so pretty in yellow and purple!! 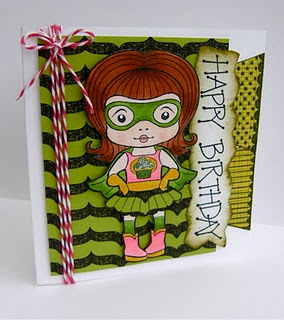 This FUN Birthday card with our Super Cupcake Marci was made by Annette. We can't get over the clever use of paper piecing on Marci's skirt!! LOVE it!! 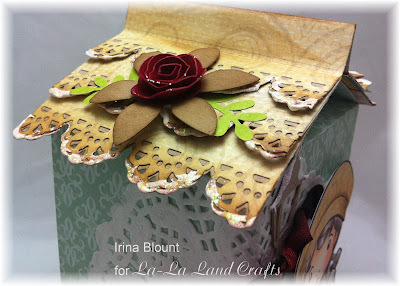 And here is one more - have you seen a more CREATIVE use of a rubber stamp??!! Faye, you blew us away!! LOVE how this card with our Marci with Flower makes such a big statement - NO COLORING REQUIRED!! 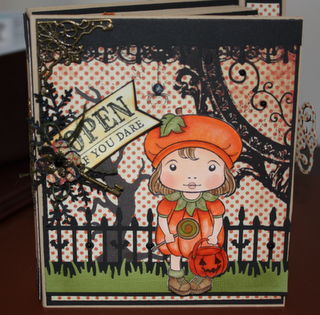 Only a few more days left to enter to OCTOBER CUSTOMER GALLERY!! The link is on the top of our blog. GREAT NEWS!! Our November 2011 Release is available in RUBBER!! Pre-order yours TODAY, shipping on November 1st!! Click HERE to go SHOPPING!! I had this idea in my head for quiet awhile now and then when I went to work on it, it didn't turned out the way I thought it would. A lot of scraps into the garbage can, but here is the result. I do like it even more than my original idea though :-) I know I will love having my favorite Marci and Luka displayed on my desk all year long. I used wooden album covers for the base of my calendar. 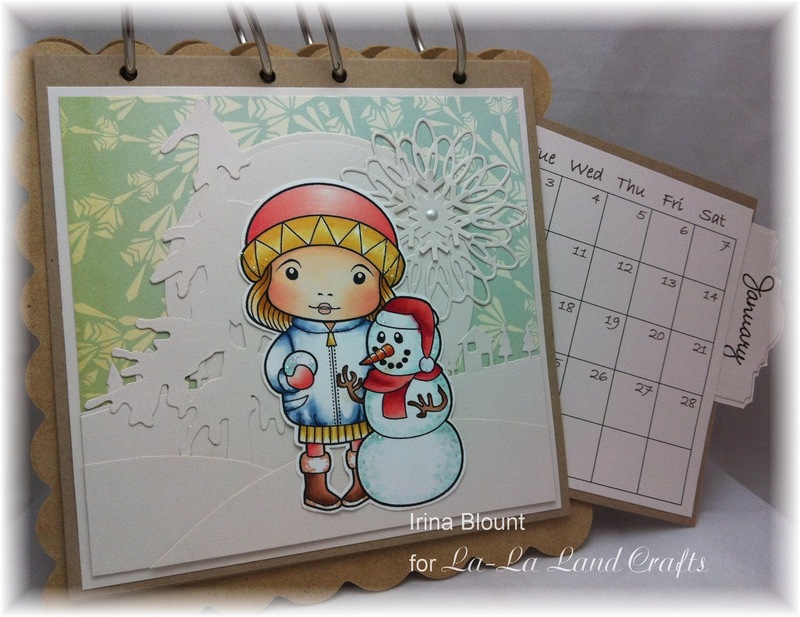 The base measures 7" x 7" and the calendar pages are 6" x 6". The page of the month is displayed on the front/top and the other pages are inside of the frame. Each page has a side pocket with a calendar tacked inside. Pullout tabs have the names of the months of them. What's great about having calendar in the pockets and not permanently attached is that you can use it the next year too by just printing the another year calendar. 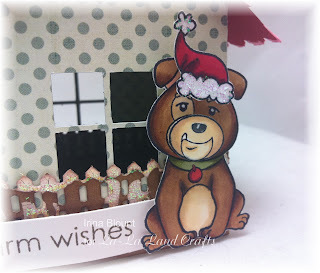 And, if you ever get tired of it, you can use the fronts to make cards!! The pockets can also be used to store some photos/memorabilia throughout the year, and/or you can tuck in some special notes, etc. Most likely I will also add something to the covers too. Still trying to decide. And you can also add ribbons and twines to the book rings to make them festive to your preference. Did you know that I hold WORKSHOPS every month? If you live in Northern California, check it out!! Every workshop is different and we make tons of different things. Most if not all of the projects feature our stamps!!! 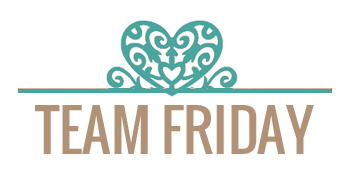 Thanks for joining us and don't forget to drop by on Friday to see more and you can always link up your makes to the Customer Gallery for a chance to win a prize! Check out NEW section on our website - CLEARANCE!! 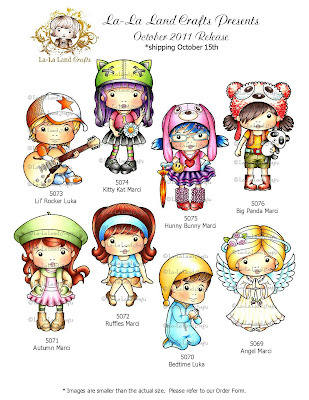 Stamps listed in this section are being discontinued, once we sell out they will be GONE!! This is your LAST CHANCE to get these stamps AND at the DISCOUNTED PRICE!! FREE SHIPPING still applies to all purchases of over $50 (US only). Well, let's get on to our gorgeous projects from our fabulous DT to inspire you. 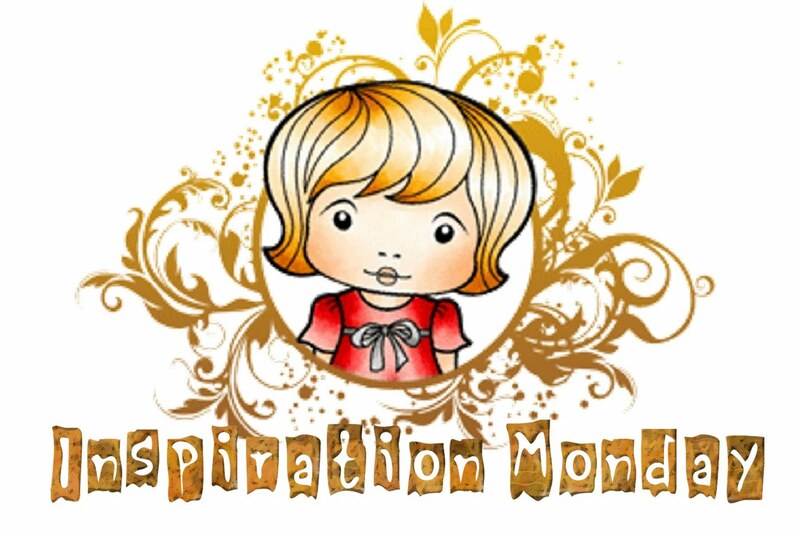 We hope our post today inspires you to be creative. Don't forget to link up in the Customer Gallery if you play along. You could be the lucky winner of our monthly prize..
As you probably already know, a couple of months ago we started another La-La Land Crafts blog, the one that is FOR KIDS and BY KIDS. 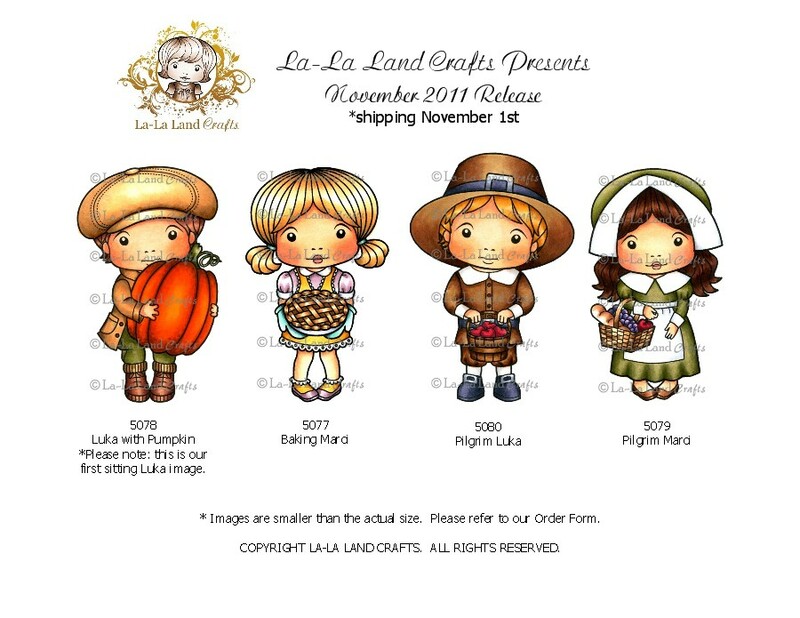 We call it La-La Land Crafts For Kids. 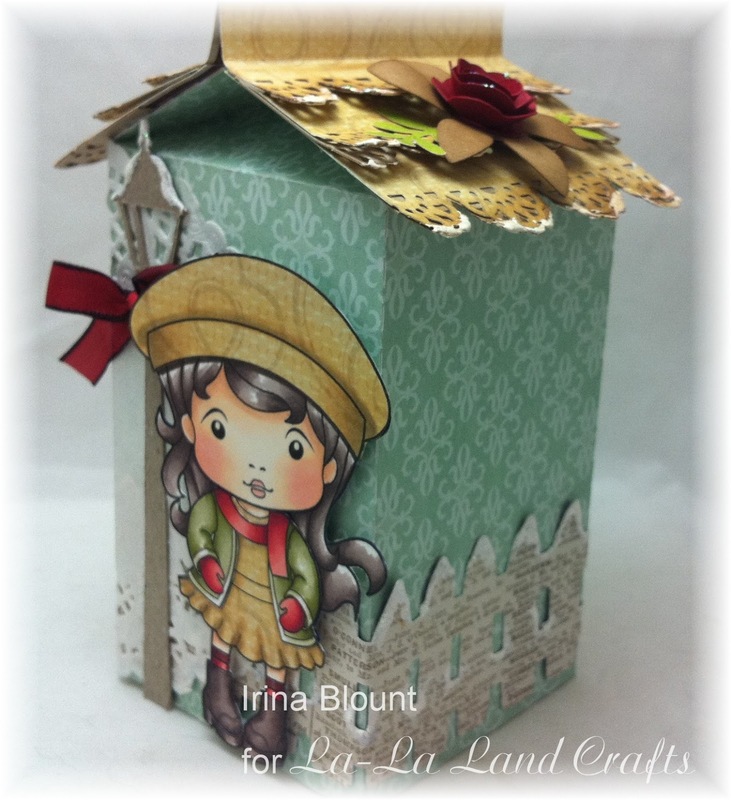 This blog was started with the idea to have a place for children to share their love to create with our stamps. 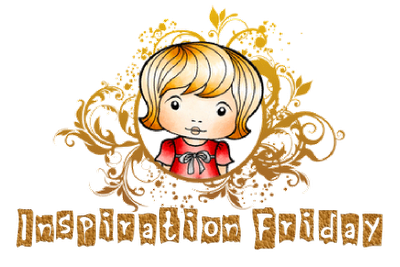 We have a page there where you can read about our wonderful Hostesses - we got four girls of ages 8 to 12 who share their creativity with you by posting their projects on the blog frequently. We have bi-weekly contests for children too!! And, everyone who participates earns some Marci Money!! How fun is that? Now you must have be wondering what all of this has to do with the BLOG CANDY :-) Well, we would like to get more exposure to our new blog to show children that their work is being seen. Please show them your support by displaying our LLLC4Kids Badge on your blog, join our Facebook page and most of all please visit our LLLC4Kids often and leave them some love by commenting on the posts and contest entries. 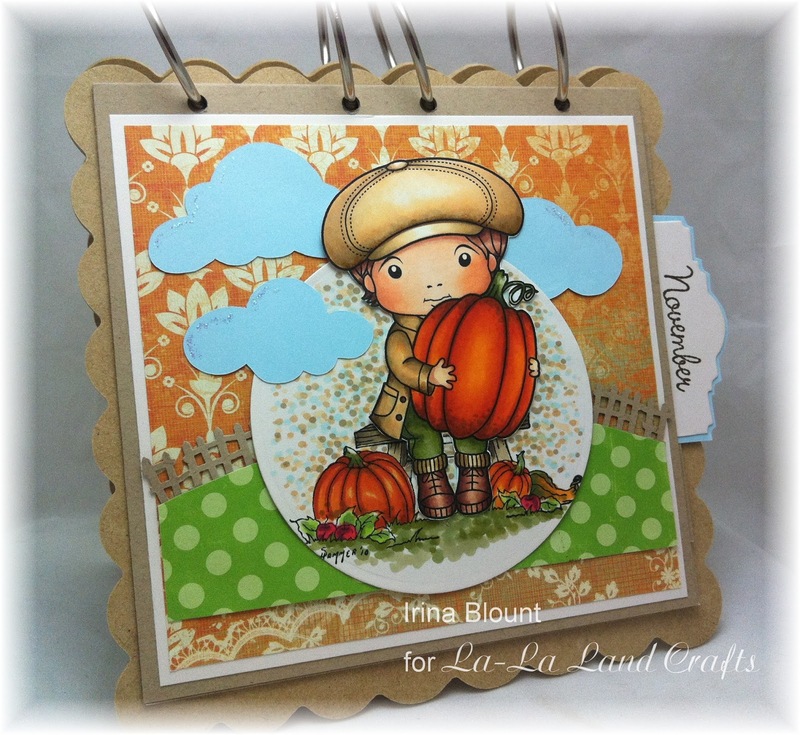 Our Blog Candy today is nothing else but our last rubber stamp release!! Yep, one lucky person will WIN ALL eight STAMPS from our October 2011 Release!! 1. Grab the code (below the picture) for our LLLC4Kids Badge and display it on the sidebar of your Blog. 2. Subscribe to our LLLC4Kids Blog. Click HERE. 3. Join our LLLC4Kids Facebook Page. Click HERE. 4. After completing as many things as you can do from the above, please leave a comment on this post to enter into the drawing. You have until October 31st to enter. We will announce the WINNER here on our blog on November 1st. Thank you so much in advance for your support!! NEW Release - TWO MORE!! !